Vincent Ochieng' competes at the All Africa Games in Maputo. The Kenya Taekwondo team of four leaves the country Friday for Cairo, Egypt for the forthcoming Olympics qualifiers set for January 11-17. The four includes 2011 All Africa Games silver medalist, Gladys Mwaniki, Sarah Wanjiru, Steven Karuga and Vincent Ochieng’. Mwaniki who was part of the team that competed at the team cup in Madagascar also won silver at the 2007 All Africa Games and she will be looking to qualify in the under 67 Kg fly weight category. Wanjiru will be making her international debut in the under 57 Kg bantam weight category. Karuga and Ochieng will be looking to use the experience gained at the 2010 All Africa Games in Maputo to qualify for the London Olympics. In the absence of veteran Dickson Wamweru who represented the country at the 2008 Beijing Olympics, Karuga the bronze medalist from Maputo (fin weight) moved up to takes up his position. Karuga who featured in the under 54-fin weight in Maputo will move to under 58 category –a mixture of fin weight and fly weight category. Arnest Olayo is coaching the team and is assisted by trainer Philip Khaemba and team manager, Jaynefrancis Kitala. 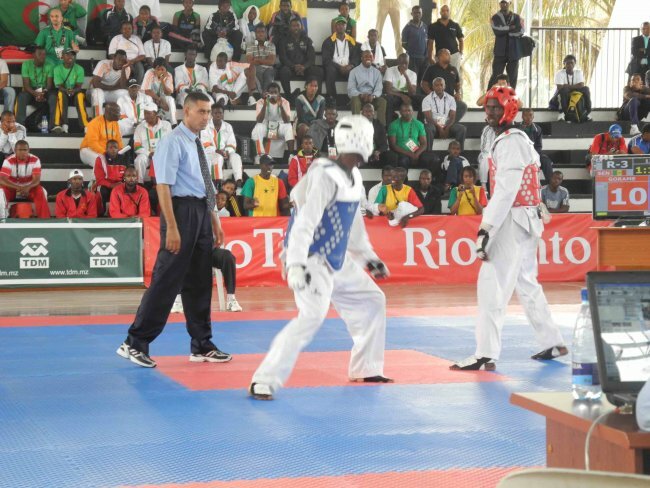 According to Kenya Taekwondo Federation (KTF) chairman, Bobby Musinga who visited the team’s training camp at Nyayo national stadium basketball gymnasium Wednesday, the target is to retain the number, which last qualified for the Olympics games. “Our plan as the federation is to ensure that we take at least two players to London if we cannot take all of them. They are under a professional coach who is the highest ranked coach in Kenya, I think we have a higher chance and we must make sure that we use it wisely,” said Musinga. Musinga is satisfied with the team's preparation which he believes is better compared to the training ahead of Maputo. “For the first time we had a chance to train at this facility (Basketball Gymnasium) which is also most the same to the one they will use in Egypt, this is one of the best preparations we’ve ever had." At the last Olympics games, Kenya was represented by Dickson Wamweru and Milka Akinyi who were not available for selection due to work commitments. If they qualify KTF is hoping to send the players for a buildup tournment in Alexandria, Egypt in February as part of their preparation for the London games.